« Arsenal defeated at home by Wimbledon. Who was the manager? This article continues our long running series “Norris at the Arsenal”. There is an index to all the articles in this series at the foot of the page. Here as the final point we move on to the issue of why so many clubs voted for Arsenal rather than Tottenham as the additional club that should be in the 1919 first division. Tottenham had argued that the precedent in two previous league expansions was to allow the relegated clubs to stay in the first division and bring new members into the second division. Some answers have been given. The precedent argument fell at the first hurdle since the League clearly had previously changed the rules several times to suit the occasion. Also Arsenal were supported by the very influential “Athletics News” who made a strong case for the club, and the northern clubs were supportive of Arsenal for being the team that had brought League football to London. Sir Henry was a popular and admired figure because of his war work and his raising of the Footballers’ Battalion. Here was must pause for a moment to debunk a popular theory raised in the book “Forward, Arsenal” by Bernard Joy. For many years this book published in 1952 was considered the definitive Arsenal history, primarily because there was nothing else of consequence available. Joy had been an Arsenal player from 1935 to 1947, had played as an amateur (considered at the time to be a player of some consequence since he eschewed pay). He played 86 times for Arsenal, and once for England (also playing ten times for England Amateurs). And he was a journalist. As such he was an ideal person to write a book about Arsenal’s history in 1952 – and you may well still be able to find the book because it was republished by the much lamented GCR Books in 2009. Ideal because not only was he an educated man (he is said to have gained a degree at one of the colleges of London University, but I can’t establish which one) and I would like to know more on this because it is also said that he played football for London University, but I am not at all sure the University had a football team at the time. The individual colleges did, but the whole university? I am not sure. (I will also declare an interest here since I happen to be a Master of Philosophy of the self-same university and I like to get these things right). Anyway, by the time Joy wrote his book he was firmly ensconced in Fleet Street, and a mate of Tom Whittaker manager of Arsenal. He was going to tell the story according in the way Arsenal wanted it told, and Arsenal’s board of directors, descendents direct of the group that overthrew Norris in 1927 wanted the story told in one way: to Norris’ disadvantage. And so it is told in Joy’s book. What he did was report a speech by John McKenna, the President of the Football League in which the President, instead of being Presidential and chairmanlike promoted the idea of Arsenal going back to the top of the league. This is interesting, because the other suggestion made was that Sir Henry himself made a spur of the moment speech. Neither story is true as far as we can tell, in that none of the newspapers of the time reported such speeches. Indeed even the Tottenham Weekly Herald did not include any mention of a speech by either the chairman or Sir Henry, and if any newspaper reporting the events of the day was likely to report such a speech it would be the Tottenham Weekly Herald, who expressed deep concern about the outcome. The writer did say, “The capability of the League to dispense justice is now a shattered ideal.” But he didn’t mention a speech. Here however is what Bernard Joy invented in 1952, 33 years after the event. However although the local Tottenham paper didn’t want to tell us, there were a couple of other things in Tottenham’s background that indicate reasons why clubs might not have voted for them – and there is the mishandling of events over Arsenal’s move north (which also won the support of other clubs). Tottenham had chosen first off to join the Southern League, and they did this not because they couldn’t get into the Football League – but, unlike Arsenal, they chose the Southern League in preference to the Football League. Then after 12 years in the Southern League Tottenham decided to try their chances with the national Football League, which by then was getting much bigger crowds than the Southern League clubs. As a way of doing this, in February 1908 Tottenham (along with QPR) resigned from the Southern League and let it be known that they would be applying to join the Football League. There is a certain irony in this situation, given what happened in 1919, in that QPR could be said to have been justified in their application as they had just won the Southern League. Tottenham however were nowhere near the top when they put in their application and ultimately just managed to scrape into 7th place beating Northampton Town to that spot by having a goal average 0.01 better than Northampton. Tottenham had joined the Southern League in 1896/7, by which time Arsenal were entering their fourth year in the Football League – entering coincidentally just as Royal Ordnance Factories FC, who had split from Arsenal over the issue of whether working men (rather than gentlemen) were capable of running a club, were exiting the league, unable to complete their fixtures through lack of finances. Tough business, running a football club. Tottenham had played 12 seasons in that League and had won it once, come second twice, and managed fourth twice. So seven top four finishes in 12 years, which doesn’t sound too bad until one realises that there was between 11 and 16 teams in the League during this period. Tottenham were in fact not even big fish in a little pond. They were a little above average sized fish in that minor pond that was the Southern League. What happened is covered in detail in an article by Andy Kelly on this site and I won’t repeat all the details, but Tottenham were involved in a scandal which included allegedly bribing another team to leave the Football League so Tottenham could take their place and it is quite possible that this past scandal adversely affected voting in 1919, (although to be fair they were not the only club involved in such scandals). It is indeed interesting that there is evidence of a Tottenham bribery scandal (although of course as this is a history of Arsenal I have not investigated the issue that deeply), and the story that Arsenal were corrupt in getting elected might well have sprung to an avid Tottenham supporter’s mind long after the events as he or she tried to cover up a Tottenham sin by planting it on Arsenal. As we have seen, no one suggested anything was amiss with Arsenal’s election in 1919 until many many years later. Finally there are two more articles on this if you really want to cover everything to do with the election. There is another highly informative piece on this website: “Why don’t Tottenham have any footballing friends”. And if you would like to study Tottenham’s view of the time that there was a precedent for them being re-elected to the 1st Division, there is a complete run down of all admissions and exits to and from the Football League on the Non League Matters website. Overall we can see that this whole issue of Arsenal moving to Highbury through to Tottenham’s attempt to get voted back to the First Division was a PR disaster for Tottenham. Tottenham had vigorously opposed Arsenal’s move north, ignoring all the precedents and rules of the League. They had lost out in their attempt to stop the move, (indeed the League wouldn’t even call the emergency meeting Tottenham asked for) and then even more humiliatingly had found that in terms of crowds, the move of Arsenal north had done Tottenham some good. Then they had had the misfortune to have their ground closed from 1916 onwards, as it was taken over for the development of munitions and had to go cap in hand to Arsenal for a loan of a ground. Arsenal were magnanimous and allowed Tottenham to play at Highbury. Finally they had opposed Arsenal’s election to the first division, putting their own case forwards, and found that they didn’t have very many footballing friends. Things only got better in 1920 when they regained their first division status at the first opportunity. But now let us return to the events of 1919. Having previously voted not to extend the season the League now changed its mind and voted to extend the season by allowing matches on the last Saturday of August and the first Saturday of May. A new system of sharing the money taken at the turnstiles was also introduced (based on what the London Combination had done) with the home club having 80% of the income and the away team 20%. There was also discussion of the maximum wage, although there is no indication in the minutes of the meeting if Sir Henry Norris again put forward his plan that the maximum wage should be abolished. For season 1919/20 the members voted for a maximum wage of £4 10s (£4.50). Henry Norris made a speech at the AGM of the League thanking those who had voted for his club saying it was now up to the directors to use the opportunity to pay off the club’s debts as quickly as possible. He also wrote to JAH Catton of Athletic News to thank him personally for his input and support. And of course life elsewhere went on, as for example on 11 March Sir Henry made his maiden speech in the House of Commons, quite appropriately on a housing matter, during the Committee stage of the Rent and Mortgage Interest (Restrictions) Bill. This Bill proposed capping the levels of rent on working-class housing, that had been put in place as a wartime only measure in 1915. But rent strikes and housing riots since the end of the war showed what a contentious rent rises were and the government proposed that it should remain for two more years. In effect, so important was the issue of controlling rents charged by private landlords that such an act remained until it was abolished in the Housing Act of Margaret Thatcher’s government in 1988. Meanwhile Henry Norris’ friend, the entertainer George Robey continued to arrange charity matches and on 12 March there was another such in which his team played an RAF team at Stamford Bridge. No details of the game survive, as far as I can tell, but given Sir Henry’s support for Robey’s ventures it is quite likely that several Arsenal men were involved. This match was followed by Brentford 2 Arsenal 0 – a game between the top two teams in this final wartime league. 22,000 turned up. Henry (Bert) White played for Brentford, and it could well have been his performance on this day that made Arsenal buy him ahead of the new season. There are details here. With the dust settling the press began to consider what would happen next. Athletic News focused on the talk of raising admission prices, in order to pay the new maximum wage, while the Islington Daily Gazette suggested that if Arsenal raised its prices, more of its supporters should have a chance to stand under cover. 24 March saw Sir Henry raise a question in the House of Commons for the first time, and it was an interesting one as it links to issues of the news that we face today. Posters had been appearing around London placed on walls by far right groups, denouncing members of the government as traitors. It seems Britain was not just fighting a war in Ireland, it was also now facing discontent both from workers and agitators. And now, with the flu epidemic finally retreating, there was an outbreak of smallpox in parts of London. But this was not enough to stop the football, and on March 22 Arsenal played West Ham (now newly elected as a Football League club from August) and beat them 3-2 in front of another 20,000 crowd to make it three wins in four so far in the month, although to be fair West Ham did lose a man to injury in the 10th minute, leaving them one short for most of the game. Next up was an “away” game against Tottenham, this time to be played at Highbury – with White Hart Lane still being unavailable, and the Clapton pitch considered pretty much unusable. This last London Combination match of March, on the 29th, found the pitch covered in snow. But nevertheless 33,000 turned up for this “away” game with Tottenham – the last London Combination meeting between the two clubs. 33,000 turned up, the gate money was £1300, and Arsenal won 1-0. It was the highest wartime crowd at the ground at this time – although that record lasted only one week! This is also the game in which we suspect Clem Voysey made his first appearance for the club. There was in fact one more match to be played in the month – the second round of the Victory Cup, and it had such significant implications that I shall leave it for the next episode. Here are the games we’ve covered in March 1919 prior to that last match. 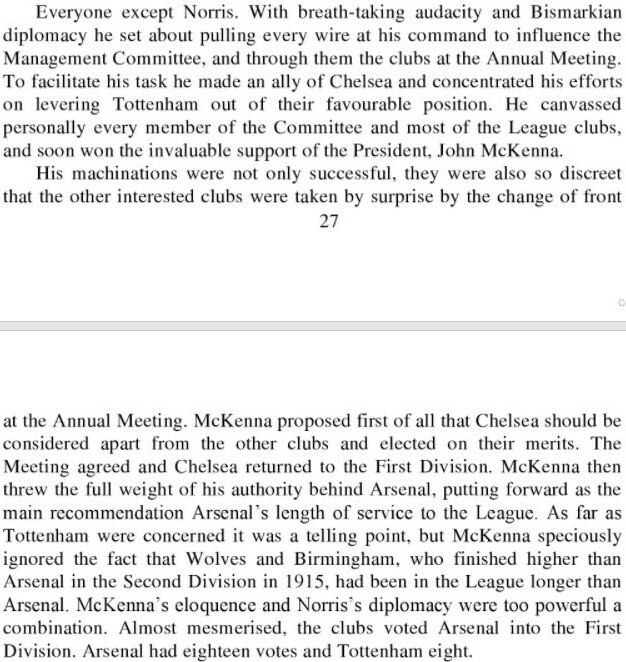 2 comments to Why did the clubs vote for Arsenal rather than Tottenham in March 1919? could you perhaps clear this up? I didn’t find anything about Wolverhampton campaigning, but I presume they got votes from other clubs in the Midlands – although Nottingham Forest would also have taken some of those.